JAKARTA (The Jakarta Post/Pacific Media Watch): After seven years, the English-language daily Jakarta Globe published its last print edition on Tuesday, marking the paper's complete transformation into an online publication. The Globe prepared its print edition for Tuesday with the headline story titled "A Last Hurrah... And a New Beginning". 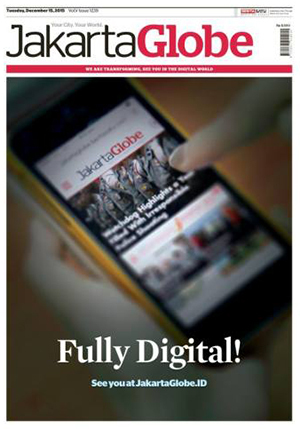 "As the Jakarta Globe moves online, we look back at a memorable and award-winning seven years in print," the paper's publisher Berita Satu Media Holdings wrote on the front page. The newspaper's owner, PT Jakarta Globe Media, is part of BeritaSatu Media Holdings, an associated company of Lippo. On Sunday, current and former Globe journalists started the hashtag #jglasthurrah as a testimonial to their time at the paper, while others used the hashtag to upload photos of their work in preparing the paper's final edition. PMW editor: Several Pacific Media Centre-affiliated student journalists have been on internships at the Jakarta Globe.